After it was announced the wildest tongue in the northwest would make its eagerly-anticipated return against Brian Stann at UFC 136, many fans contemplated how Chael Sonnen would go about selling his middleweight shootout against the American war hero. It’s not bad enough Stann has emerged as MMA’s modern day G.I. Joe, but Sonnen is also coming off one of the most turbulent off-seasons a fighter has ever endured. Would the sport’s most articulate smack-talker dare verbally assault Stann like he has done to so many others? Sonnen posted back-to-back unanimous decision victories over Okami and Marquardt, respectively, prior to losing his title fight to champion Anderson Silva, so it’s understandable why he’s moved past them. However, Stann is a beast he has yet to tame and he fully intends on allowing this sleeping dog to lie. “I do like Brian Stann and I’m not going to pretend I don’t. 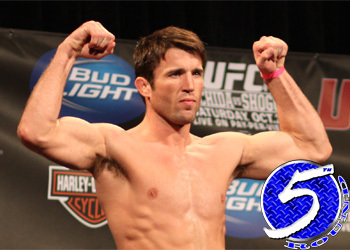 Stann’s a stud and I tried to not get on the docket with him,” Sonnen stated. “I did everything I could to get an easy fight. I tried to get [Lyoto] Machida to lure into a fight, I tried to get Wanderlei [Silva], I tried to get Anderson. Sonnen has been out of action since getting submitted by “The Spider” at UFC 117 back in August 2010. His tango with Stann takes place October 8th inside Toyota Center in Houston, Texas.